I should feel guilty as I didn't do anything that I should have done this weekend, instead I played in my scraproom all weekend. This is a card that I did just for the heck of it. I guess it's going in my stash for when I need a unexpected card. Tilda's dress is paper pieced and there is alot of dimension on this card. As always, thanks for taking the time to stop by for a visit. Beautiful card. I am loving this challenge of black, white and a pop of color. You definitely made it pop with that touch of color. 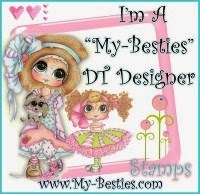 It's adorable Julie, love the design and those pretty shades of pink really makes it pop. THis is one of my favorite images. Cards like yours are so inspirational! I'll just have to ink her up myself. 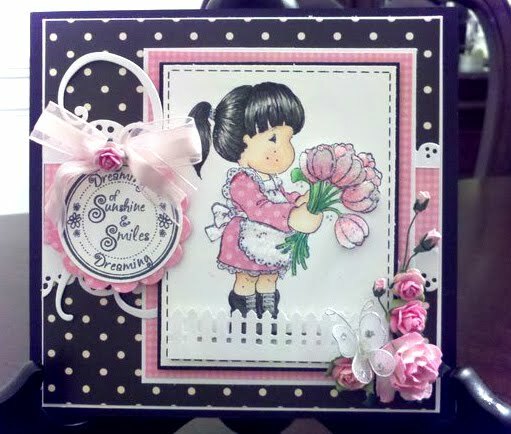 Beautiful card, Julie! Love the pop of pink, your coloring and paper piecing, and all the dimension. Great job! Beautiful card. Love the paper piecing and colors you used. Great job! Absolutly adorable Julie, love how the flowers pop out! Totally stunning! Love the design and colors. Polka dots always turn me on! What a stunning card..love the paper piecing! Super duper black/white/and pop of color card! Beautifully colored image of Tilda and I love all the layers you've used here. I see no reason to take some time to rejuvinate our souls by doing something we love to do. I think it's absolutely necessary!!!! I'm glad you took some time to just play and have fun! Very nice card and I do like your paper piecing! I really like your design and love the fence along the bottom! Such a lovely card Julie, gorgeous papier piecing job. If i see well, the bouquet Tilda holds in her hand is in dimentions, very very lovely. Nice sparkles, awesome details. Beautiful! Beautiful card! Love the sentiment too. Wow just a gorgeous card!!! Love the colors and the image!!!! Fabulous!!!! Absolutely beautiful!! I love the black and pink and Tilda is beautifully colored!!!! Thanks so much for joining us at Magnolia-licious! Hey, Pixie Dust Paperie is giving away a monthly kit, please come join in the fun!